Another repost! I think it’s a post worth a re-visit in its own right (or it may be interesting to new readers of the blog) but I’m also able to include some new photographs and a brief chronological update. They called them ‘Thingoe’s Follies’ – the eight homes built on Stow Road in Ixworth, Suffolk, which formed the first council housing built (in 1894) in the English countryside. And so they were if the attempt to provide decent homes for some of the poorest in England – the agricultural working class of the day – was folly. In reality, they are a site of struggle. Depending on your perspective, it’s a story of rural class struggle, pitting an oppressed labouring poor against the entrenched Tory landowning class which ruled village England before the Great War. Or you might see in it an enlightened Toryism – more Downton than Tolpuddle – that remembered traditions of noblesse oblige and adapted the local state to its purpose. Most dramatically, it could be taken to mark the rise of modern Liberalism, a radicalism mobilised by and personified in the unlikely figure of the village’s new vicar, FD Perrott, who believed that his care of souls extended to the tortured bodies of his poor parishioners. You pass through our quiet villages and you see old cottages covered with honeysuckle, roses, and ivy; you think how beautiful! how restful! But you little imagine what sad decay and misery the outer beauty covers. There is a row of houses, the total number of inhabitants is forty-four, and there are three closets for their use. In one house, consisting of two rooms, there are ten in family… Doors are very bad, and the walls tumbling down. When it rains much, the water runs from the back kitchen into the sitting-room, and forms a pool in the centre. Such conditions were shocking to Perrott who arrived in the parish in 1888, finding that ‘the Church had scarcely anything to do with the people and the people scarcely anything to do with the Church’. One of his first acts was to help form – at a time when agricultural trades unionism was a growing though embattled force in the country – the Ixworth Agricultural Labourers’ Association. The Association surveyed local housing needs – both the sorry condition of existing homes and the desperate need for new – and petitioned the local Rural Sanitary Authority (the Thingoe Board of Guardians at this time) to take action under the 1890 Housing of the Working Classes Act. A certain number of families will be removed from unwholesome lodgings, devoid of proper conveniences, to healthy dwellings with a sufficiency of garden ground; and it is reasonable to suppose that there will not only be less poverty arising from sickness, but that there will be also an addition to the family resources from the sedulous cultivation of the soil, in both cases with results favourable to the ratepayers…Upon economical grounds alone, therefore, the putting in force of Part III of the Act is capable of being justified; but it is impossible to forget that we are in presence of other considerations, social and moral, which, though not susceptible of being gauged by money values, are intrinsically of still higher importance. There (with just a little archaism) you have the economic and ethical case for council housing – as true now as then – made by a Tory aristocrat. This contemporary image shows the allotment space to the side of the homes still being put to good use. Still, the question of finance remained. Hervey had assumed the expense would be borne by the wider district rather than the parish of Ixworth. The Sanitary Authority seized on this alleged unfairness to its ratepayers to secure a second inquiry, ostensibly to tackle the question of funding but in practice used to re-open the entire question. They were not and had not shown themselves to be guardians of the poor. They had simply been guardians of the rates…They had not treated this case as a poor man’s one but as only as one touching their own pockets… Could there be a body in England so fatuous? Under the shadow of the luxurious ‘Hall’, at the gate of the tenant-farmer’s comfortable homestead, the labourer (upon whose work both live) drags out a hard life, compelled with wife and children to find shelter and make ‘home’ under a roof beneath which neither squire nor farmer would stable their very cattle. The inquiry, under Colonel Frederick Pocklington, was convened at 3pm in a deliberate attempt to exclude local workers – though a newspaper report records (after its list of the local great and the good) that ‘a few labourers stood at the back’. (7) It overturned the result of the first inquiry. At this point, Hervey returned to the field. 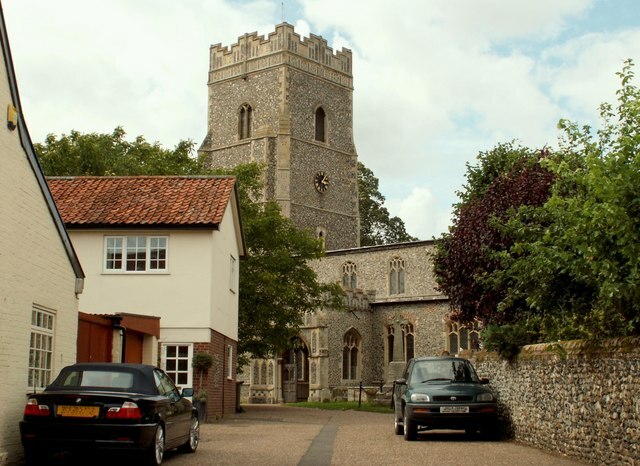 He secured legal opinion that – as no new evidence had been adduced – Pocklington’s decision was invalid. The verdict of the first inquiry decision stood – the Thingoe Sanitary Authority was compelled to build. 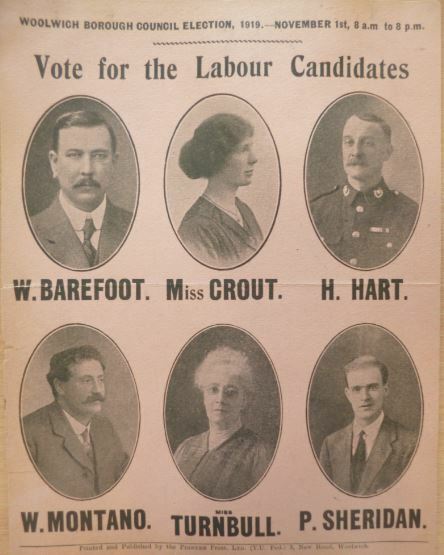 Elections to the Authority in 1892 returned a reforming majority and Perrott (as chair) served for one meeting to secure the housing’s final go-ahead. After all that sound and fury, the results might seem disappointing. 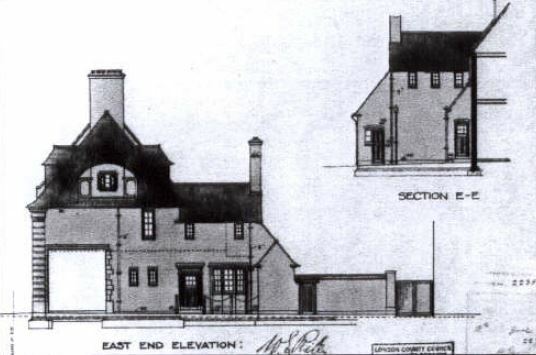 Eight cottages, designed by Mr F Whitmore, Suffolk County Surveyor, were built on four acres of land at a cost of £1700. They comprised four semi-detached, two-storey houses with a single-storey extension at the rear, housing kitchen, washhouse and lavatory. With its homes let at £5 5s a year and an additional charge for their large, allotment-style, gardens, financed on a short thirty-year loan, the scheme was not a financial success and the houses proved too expensive for the poorest of the local people for whom they were originally intended. A side view with a glimpse of the rear extension. But they were the first fruits of a hard-fought struggle by which the rural working-class would escape a reigning near-feudalism. By 1900, just six rural district councils (the new bodies of local government established in 1894) had adopted part III of the 1890 Act and Thingoe’s eight cottages remained its sole concrete fruits. A 1900 Act, intended to support council housing in the countryside by allowing county councils to build where district councils refused and formally giving parish councils the right to petition for action, had little impact. As for the ‘village Hampdens’ of the Labourers’ Association, I can provide neither names nor details. The houses remain their monument, one pair, no’s 1 and 2 Stow Road, are now Grade II listed – a reminder of the struggle of working people to secure decent housing and its continued necessity. Visiting the 1894 homes, it was good to see the story of council housing brought closer-to-date with an attractive post-1945 development immediately behind on Peacock Rise – some modern semi-detached homes from the 1960s (?) and some of the bungalows for elderly people found so often in our villages. (3) Lord Francis Hervey (1846 –1931), educated at Eton and Balliol College, Oxford; a barrister and Conservative MP from 1874-80 and 1885-92. 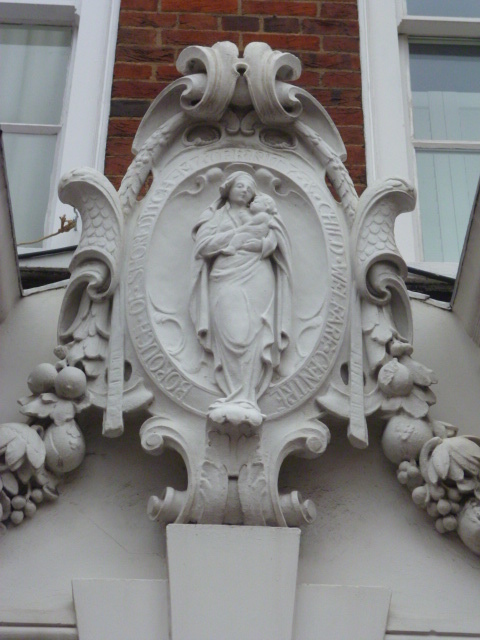 However, he had also served for three years from 1876 on the London School Board as a member for Finsbury and this perhaps gave him a better understanding of working-class conditions. He went on to become head of the Civil Service. (4) Quoted in William Walter Crotch, The Cottage Homes of Old England (1908) – the fullest guide to the intricacies of the process. (9) Andrew Motion, ‘Forget Shoreditch: It’s our rural villages most at risk from gentrification’, Daily Telegraph, 26 October 2015. The Rural Housing Alliance published Affordable Rural Housing: A practical guide for parish councils in December 2014. I’m on my hols but there is an addition to the blog today – a new page (which will be updated) which provides a location and brief details of all the posts to date. You can click on the link just provided or find it at any time by clicking on the ‘Map of the Blog’ link at the top right of the page. I’ve tried to ensure a decent geographical coverage but it reminds me that there’s plenty of good stuff out there which deserves coverage. I’m very happy to receive suggestions (recommended sources and detail always welcome!) of places and topics to cover or guest posts if there’s something you would like to share. When I came to consider local government, I began to see how it was in essence the first-line defence thrown up by the community against our common enemies – poverty, sickness, ignorance, isolation, mental derangement and social maladjustment. The battle is not faultlessly conducted, nor are the motives of those who take part in it all righteous or disinterested. But the war is, I believe, worth fighting and this corporate action is at least based upon recognition of one fundamental truth about human nature – we are not only single individuals, each face to face with eternity and our separate spirits; we are members one of another. The words of Winifred Holtby in 1936. I started this blog back in January to celebrate the efforts and achievements of our early municipal reformers. I’m taking a break this week but it’s an opportunity to review what’s been covered and, if you’re new to the blog, provide a little tour of what you’ve missed. There’s been a lot about housing – probably the most important sphere of municipal endeavour and the one with the largest direct impact on the masses of people. The 1890 Housing of the Working Classes Act provided the initial breakthrough, seized upon by the London County Council, most famously, in Arts and Crafts-inspired developments at Millbank, Totterdown Fields and the White Hart Lane Estate but also by smaller, progressive councils such as Sheffield in the Flower Estate and Battersea in the Latchmere Estate. The First World War gave impetus and urgency to the efforts of government to house the people, supported by Housing Acts and financial subsidies of greater or lesser generosity. The fruits of these were seen principally in the massive new ‘garden suburbs’ such as the LCC’s Becontree and Downham and Woolwich’s Page Estate in the London outskirts and Manchester City Council’s Wythenshawe Estate, then seen as ‘the world of the future’. 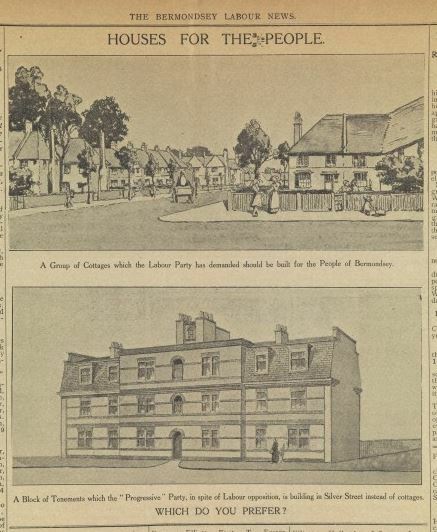 For most, working people and housing reformers, ‘a cottage home for every family’ remained the ideal, seen most clearly in Bermondsey’s small Wilson Grove Estate. More pragmatic councils in densely settled boroughs embraced tenement building such as that in Aldenham House and Wolcot House, St Pancras. 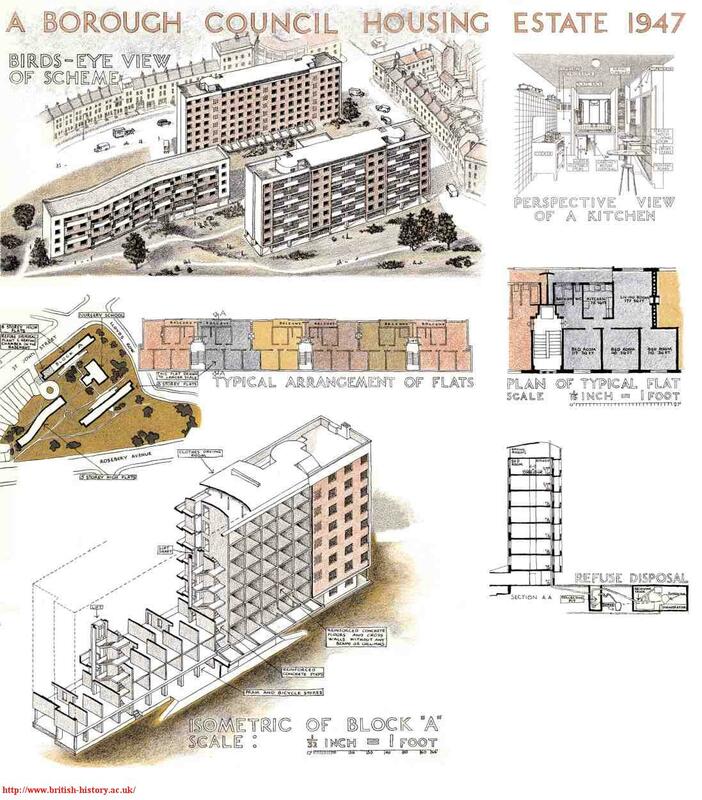 Housing architecture and thinking were generally conservative but there were some early modernist designs, inspired by Continental example – in the LCC’s Ossulston Estate, for example. Leeds’ massive Quarry Hill scheme was an inner-city product of the first large-scale slum clearance efforts of the 1930s. War, ‘the locomotive of history’, brought even more radical changes in housing after 1945. The Lansbury Estate in Poplar, for all its proclaimed modernity, was something of a throwback. Blackbird Leys in Oxford was also a postwar estate which echoed earlier suburban developments. But as ambitions, scale and urgency grew, council housing grew higher and denser. The Spa Green Estate in Finsbury was an early progressive vision of high-rise housing. Park Hill – those ‘streets in the sky’ in Sheffield – represents the trend at its most far-reaching. Resistance or backlash to high-rise on an industrial scale began in the late sixties, seen initially in Camden Council’s commitment to high-quality, low-rise housing such as that in the Alexandra Estate and Branch Hill and – in a different key – to Newcastle’s commitment to re-created community at Byker. If housing met one of the most basic human needs, it was understood by municipal reformers as part of a wider environment which they sought to make healthier and more humane. Bermondsey Borough Council – as in so many things – took the lead here with its vision of beautifying that inner-city borough. Victoria Park in London’s East End is a more typical city park but a great democratic exemplar of what parks can do to improve lives and lift spirits. 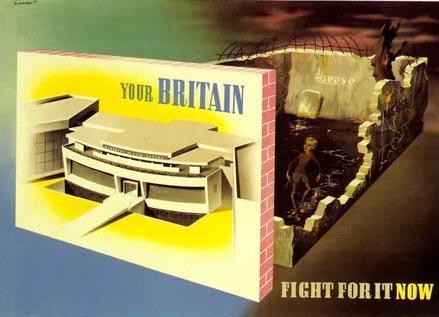 Planning on a larger scale was much more a post-Second World War ideal. The Town and Country Planning Act of 1947 deserves wider notice as a truly progressive but, in the best sense, conservative measure. Planning as a tool of benevolent social engineering has had less impact but Plymouth can be fairly described as our ‘first great welfare state city’. All such work was in the service of a healthier life for the masses of people. Local government – before the creation of a national health service in 1948 – was in the forefront of direct healthcare provision. We’ve looked at Bermondsey, for whose socialist councillors there was ‘no wealth but life’, Finsbury where nothing was ‘too good for ordinary people’ and Woolwich as examples of the range and scale of this commitment. Baths and washhouses were less striking – though ambitions could run high as seen in the Ironmonger Row Baths, Finsbury – but important contributors to the amelioration of working-class living conditions. ‘Healthy recreation and personal cleanliness…for the health and well-being of our people’ were not such trivial goals. If healthcare measures were particularly dedicated to the raising of new generations so, of course, was education – also a scene of municipal pride and endeavour as we’ve noted in the case of the London School Board. 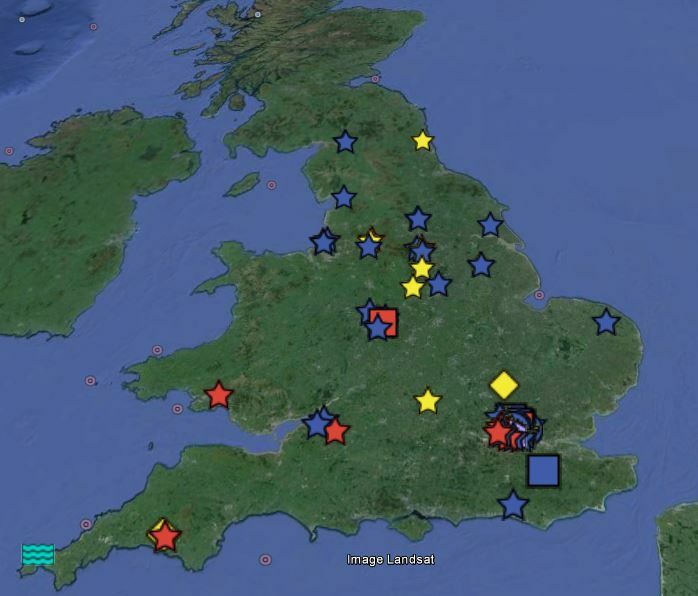 Its schools – those ‘sermons in brick’ – were ‘beacons of the future’, harbingers of a ‘wiser, better England’. With all this proper focus on reforms which not only improved lives but in many cases saved them, a celebration of town halls might seem a distraction but this blog celebrates local government and a reforming, progressive spirit of civic pride and local identity which is sometimes best seen in its great monuments. Limehouse Town Hall is a modest early example. The Council House in Birmingham is an inspiring ‘bricks and mortar monument to the municipal gospel’ of a progressive middle class. 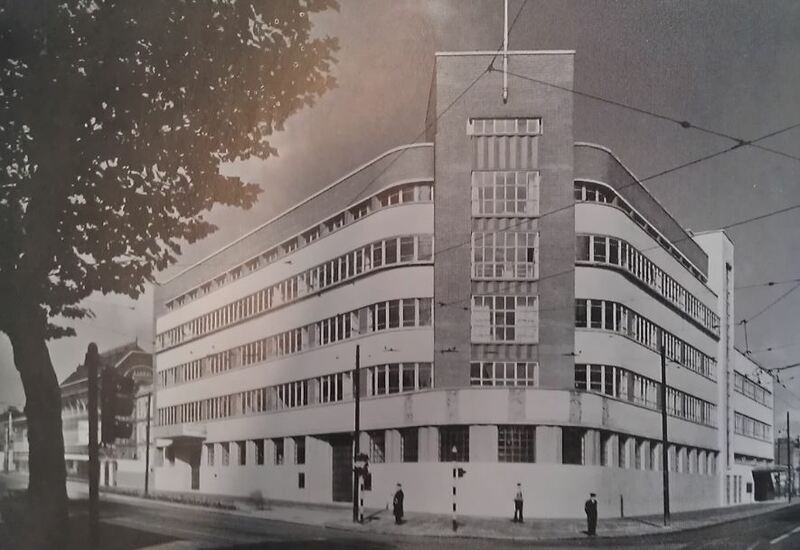 Poplar Town Hall – ‘a worthy workshop for the workers’ welfare’ – was a sign of changing times. That’s a rather lengthy list but I hope it shows what we owe to local government and how vital that work remains. The blog will continue to commemorate the effort and enterprise of our local councils and municipal reformers – men and women up and down the country who dedicated their lives to elevating the condition of the people. If you support this endeavour, please continue to read the blog, spread the word and please feel free to contribute your own ideas and your own pet projects to the continuing record. Let’s celebrate this ‘first-line defence thrown up by the community against our common enemies’.